So amidst all the silly roller-coaster stock market stuff causing all sorts of shenanigans in January, how did I do in the first month? I’m really chuffed with this great start! 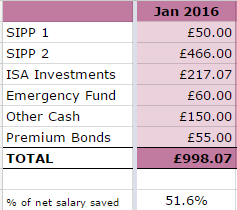 Looking back on 2015, it appears that I only managed to hit >50% twice – my overall average had been boosted by an annual bonus I received in March. That bonus had been based on a share of Old Co’s profits – now that I work for New Co, it’s looking extremely unlikely that I will get a similar bonus so just as well I saved most of that one! This month’s savings was topped up with £17.07 from TopCashBack* and £50 from rent received. As with most people’s portfolios, the Bear Market caused my Future Fund to fall in value a little but I’m not concerned or worried. It now stands at £56,956.73. So a total of £26.21, which is a nice increase compared to last January’s £9.11! 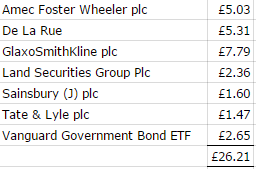 The first few months of the year are quite lean dividend-wise for me, but this is a decent start. I also received £13.37 from my P2P investments. This month, I topped up on my holding of Bloomsbury Publishing, getting the shares cheaper than when I first bought them. I’m hoping the Bear Market will last a while longer so that I can continue to buy cheaper. Library books – So I’m going to try to read 20 library books again this year. I completed just the one library book this month but it’ll be a while before I read any more because the next five books I’ll be reading will be ones that I own – I’m planning on a back-to-back re-read of the Game of Thrones books! Why? I’m hoping Martin will have finished book 6 before the end of 2016, so I’ll have the story all pretty fresh in my mind! Anyway, I’ve just started book 2 (again). Suffice to say that my other reading goal, that of attempting to read 3 books related to personal finance/investing will be resumed later on in the year! If anyone’s interested, I track all my reading via GoodReads (though not able to track these GoT re-reads) – add me as a ‘friend’ if you are a member! Hope everyone had a great January, which always feels like the longest month ever! This entry was posted in Blog Update, Books, Dividend Investing, Funds, Investment Trusts, P2P, Portfolio, Savings, Shares by weenie. Bookmark the permalink. Great start to the year weenie! We can’t control the stock market but you’ve controlled your saving and that is by far the most important thing. Thanks TFS and so true about not being able to control the stock market – just work on the stuff I can control, ie my savings and my spending! I couldn’t do your half marathons, although I guess reading the GoT books back to back is like a “mental marathon”! Am enjoying reading them again! That is a great start to 2016 and may it continue. As TFS has said there is nothing we can do about the stock market. Just keep buying quality stocks & trackers, taking advantage of the dips and in time it will all work out fine. Thanks Richard. Yes, it’s a great start for me and I hope I can keep this up. I have family coming over in the summer which will make saving a little difficult but we’ll see how it goes! Look forward to catching up with you next month! Congrats on the 51.6% savings rate. That is seriously impressive! I too have found that sites like Topcashback can save you some real money provided you were going to buy a product anyway. Also impressed in the dividend income jump from a year ago. This shows that you are moving in the right direction and the higher the dividend reinvestments become, the greater the long term compounding! Thanks! Yes, I think it’s impressive too, as I don’t expect to achieve this every month, it’s a tough target for me. Yes, I only use TopCashback for stuff I was going to buy anyway, I never just ‘browse’ for stuff to buy. Am very pleased with the dividend income jump and it looks like February will have another big year on year jump. Reinvesting the dividends is quite exciting! Thanks for your wishes and for stopping by! Very impressive savings rate for the month. Any time you can crack 50% I think it’s a huge success. I know many strove for more but that milestone is impressive. Nice increase in your dividends too. Looks like you are doing all the right things to shape a brighter financial future. Thanks for sharing. Thanks DH. I know I won’t get 50% every month but it’s a great feeling every time I do! Yes, I should see some good increases in my dividends this year as the investments I made in the latter part of 2015 should bear fruit when I get the full year’s dividends this year. The key is to keep this momentum going. Thanks for stopping by.